This is possibly the most surreal news I have had to post on this website since reporting on the UK scene. Popular 90’s Children’s Television personality Dave Benson Phillips will be heading to RIPTIDE Wrestling on August 3rd as part of the Brighton Championship Tournament weekend. 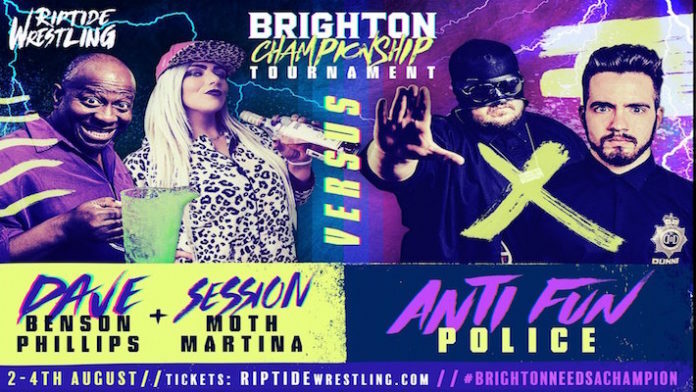 Benson Phillips will NOT be challenging for any title but instead teaming with ‘Session’ Moth Martina to challenge the Anti-Fun Police (Los Federales and No Fun Dunne). Dave Benson Phillips is probably most well known to fans in the UK as the presenter of the BBC game show Get Your Own Back. The show ran between 1991 – 2003 and was a big hit featuring people getting ‘gunged’ on a frequent basis. More recently Benson Phillips was the victim of a death hoax claiming that he had passed in a car accident in 2009. Tickets for the Brighton Championship Tournament Weekend are available to purchase via RIPTIDE’s Official website.